3D printing speeds aren’t the only fast-moving process for Nexa3D; the company, which introduced the ultra-fast stereolithography NXV 3D printer at CES 2018, had more to show off at the recent RAPID + TCT. While in Las Vegas I appreciated the time to speak with the team about that new offering and the growth experienced since our conversation less than two months prior at formnext 2017, in Fort Worth we had yet another new 3D printer to discuss. During the show, Nexa3D and partner XYZprinting were showing off the first preview of their new MfgPro220 xPF 3D printer. 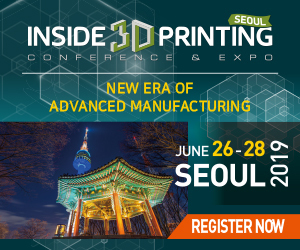 Speaking with Izhar Medalsy, Chief Product Officer, Nexa3D and Michele Marchesan, Senior Vice President, XYZprinting, provided insights into the latest advances for the companies’ alliance and a look ahead into busy plans in prolific 3D printing. “We are engineering parts and software,” Medalsy told me. The voxel-level approach to 3D printing software, picking up throughout the industry for finer detail and precise control of properties, represents a “brand new kernel” to Nexa3D’s capabilities, Medalsy explained. “We have direct translation from a STEP file to print, not losing the essense of the design, with no back and forth between STL and STEP. We use AI to automatically find faults and correct them,” he continued. The new 3D printer, with 70 micron resolution, uses engineering-grade and rapid prototyping-grade materials. The intent behind its development, Medalsy said, was that they were “shooting for big improvements” in their “very fast” machine. The 3D printer at RAPID + TCT was a preview, he noted, and the machine that is released will be bigger: “It will be a factory in a box.” 3D printing one centimeter/minute, Nexa3D is targeting accuracy and speed relying on sophisticated software. “The direction we’re after is: manufacturing is our goal,” he told me. Since we last spoke, he continued — about three months prior — six new patents have been written. Medalsy was enthusiastic about the progress being made, and what these patents represent for the company and its continuing development. Nexa3D is “always growing; this is very exciting for us,” he said. “We have placed a lot of effort in the membrane technology, and it shows. Feedback has been great, that’s what matters. We will see more in the coming future,” he said. We transitioned smoothly into a discussion of partner company XYZprinting, as we walked the expansive booth space with Marchesan. RAPID + TCT marked a big step for the company, Marchesan noted, as it represented XYZprinting’s entrance to the US market with its professional 3D printers, introduced late last year. At the booth were examples of SLS, SLA, FFF, and binder jet 3D printing technologies. “We have new things here,” Marchesan said, pointing to the PartPro 300 XT, a new FFF-based professional 3D printer. He noted as well the FFF All in One Full Color 3D printer with 3D scanner and engraving capabilities, which has proven to be very popular. “All this is manufactured by us,” Marchesan noted, “including from Nexa3D. Meeting again with Marchesan and Medalsy provided an updated look at the capabilities of these busy companies — and, notably, the accomplishments possible via collaboration with complementary partnerships. Discuss Nexa3D, XYZprinting, and other 3D printing topics at 3DPrintBoard.com or share your thoughts in the Facebook comments below.